Many older homes, particularly in London and the south-east area, have magnificent hardwood flooring hidden below years of floor coverings, possibly even painted, scuffed and all but unrecognisable as a once elegant wood floor. If this describes your floor then don’t despair - you can rejuvenate all types of hardwood flooring with a little TLC, a healthy dollop of elbow grease and some willpower! Remember that a beautifully restored wood floor is not only a source of joy and pride to the owner, but also adds significant value onto the price of your home too. If, after removing all floor covering and allowing the floor to breathe for a few days, it simply looks dull and tired then you may be able to give it back its sparkle with just a good polishing. For best effect, you should hire an industrial buffing machine. This machine is fairly lightweight and easy to use and cannot cause damage to the boards. However, if the floor requires more than a simple polish then you will probably have to rejuvenate it by re-sanding and building up a new finishing veneer. This is more likely the case for floors that have lain underneath carpets and rugs for many years, and to rejuvenate a floor in this condition correctly you will need to hire a large sanding machine. The sander will most likely be either a belt or a drum roller sander. Either way, if you have never used a sanding machine before make sure you find out how to operate it safely before taking it away. You will also require a smaller hand-held edging sander and some loose leaf sandpaper sheets to get into small corners and crevices. When you have completely removed all existing floor coverings and dry vacuumed the floor carefully you will probably spot the odd nail or carpet tack sticking up, gaps in between some of the boards, loose boards and possibly some damaged or rotten planks. All of these flaws must be repairs or replaced at this time. Never sand on top of loose board or damaged boards that you will have to replace anyway, as it is a waste of time and could damage adjoining boards too. With health and safety in mind, make sure the room you are working in is always well ventilated and wear the appropriate safety equipment of mask, goggles and gloves. Industrial sanders (drum sanders in particular) can be noisy so you might want to consider ear defenders too. When all the boards are secured and gaps filled the next step is to wet-wipe the floor with a slightly damp mop to remove any residual dust left behind by the vacuum. When the floor is totally dry then you can start sanding by moving the sander slowly and evenly along the length of the boards without stopping. A sanding machine left on idle will cause ruts in the boards, which will then require replacing. Work in a square area leaving about one foot around the edge of the room. This is the area you will hand sand so that you can get right up flush to the skirting. If your floor has not been sanded for a long time you will probably have been advised to use a coarse grain of sandpaper in the machine. However, it is always a good idea to purchase a finer grain too, so that you can use it on the second sanding. 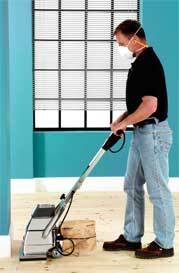 Two or three sandings should be sufficient for you to see a noticeable improvement in the evenness of your floor. Touch lightly with the fingertips and the boards should feel smooth with no snags. Any wood paint or other veneer will have been stripped completely away to leave the floor with a lightened colour, almost as if it has been bleached. It is best practice to allow the floor to rest for 24-hours after sanding before applying your topcoat of choice. You can choose from a wide selection of finishings on the market but whichever you use, make sure you comply with recommended guidelines and once again keep the room well ventilated when working.